Today we found This great Comic Book Gadget for you! 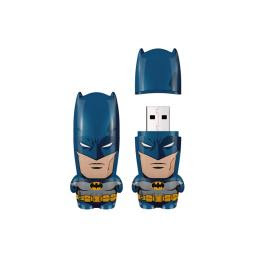 A Batman flash drive Mimobot - Perfect for keeping all those comic files safe. The cheapest we have found is waeplus.co.uk, so if you have got to have one like us, get buying. In addition to being the coolest flash drives you 've ever seen, Mimobot flash drives are so incredibly functional. Available in 2GB, 4GB, 8GB, 16GB, 32GB, and 64GB capacities, Mimobot flash drives are the best way to transport and store all of your docs, pictures, tunes, and other personal data! From Star Wars, DC Comics, Hello Kitty and Transformers, to designers like tokidoki and FriendsWithYou, to our very own Core Series characters, and Design Challenge creations, Mimobot has you covered, whatever your passion may be! Compatible with Macs and PCs, so your Mimobot flash drive comes pre-loaded with mimory and MimoDesk personalization suite of wallpapers, icons, screensavers, avatars, and more exclusive character-based content.